The latest title in the popular hack-n-slash series challenges players to complete dungeons as the leader of a bounty hunter guild. Gameloft has announced the release of Dungeon Hunter 5 on mobile devices. The hack-n-slash title places players in the role of a bounty hunter, as they lead a guild through missions to stop the uprising of the undead in the world. Players begin by creating a character and choosing one of five starting weapons (including a greatsword, magic staff and glaive). From there, gamers complete level-based missions, or dungeons, using a virtual joystick for movement, and buttons for basic, special and magic attacks. Gamers will collect currency and loot from fallen enemies, destructible environmental pieces or treasure chests, and will earn experience points after completing each mission, making their heroes stronger over time. As players collect excess or lesser loot, they can fuse these items into their favorite weapons and armor pieces to make them stronger. Pieces can also be evolved using the collectibles required for specific recipes. Gamers can replay missions to earn additional rewards, with each mission coming with three difficulty settings, and better rewards relating to these greater challenges. Eventually, players unlock an asynchronous multiplayer mode, allowing them to customize their stronghold and defend it from other players. Likewise, gamers can raid other players’ strongholds to steal their loot. During raids, players enter another player’s stronghold, facing off against the minions they’ve assigned to protect their land, before eventually challenging the player’s bounty hunter. If gamers can defeat everything without themselves falling in battle, they’ll receive rewards. In addition to the single-player campaign and asynchronous raids, players can complete daily and weekly dungeons and challenges in order to earn extra rewards. Extra social features include real-time chat, and the ability to bring an ally character into campaign dungeons, with this character being controlled by the game. The more allies and friends players partner with, the more social chests players will be able to open for free gear. 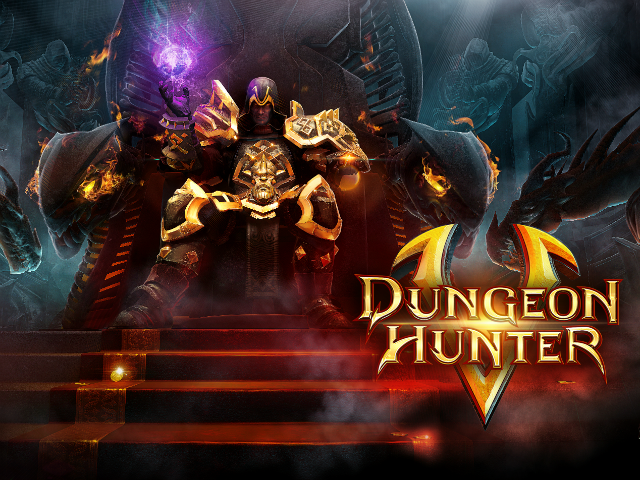 Dungeon Hunter 5 is available to download for free on the iTunes App Store and Google Play. The game is coming soon to Windows Phone.